Kula Yoga in Melbourne’s Hawthorne East is a gorgeous yoga studio and the host of my latest Yin Level One training. 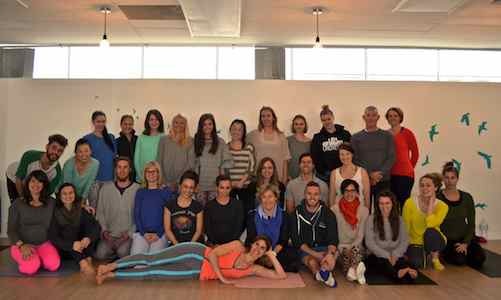 I shared an inspiring weekend with 28 movement instructors including yoga teachers, CrossFit coaches, and Physios. My growing collection of fascia images was on display as well as some new props – the Tensegrity model, mandarin oranges, and neon green “bouncing putty” and new favourite words “hydrophilic” and “hydrophobic”. Discussion was lively as we considered target areas, playing edges, yang dimensions of yin poses, hyper-mobility, and being symmetrical. Often these conversations really revolve around the deeper question, “What are the values and beliefs that shape our practice and inform the way we teach?” And can we stay true to our values but hold our beliefs lightly, be willing to test our methods, surrender ideas that have outlived their usefulness, and embrace new dimensions of ourselves through our practice? If you missed out this time, join us in August at Kula Yoga (wait list only) or in October at Grass Roots Yoga in St Kilda and join our conversation about the yin and yang of yoga!